As romantic getaways go, it's out there. Since the Curiosity rover landed on Mars and started introducing non-human space to the concept of noise pollution, the Red Planet has been in the headlines more than ever. It captures our imaginations easily, being near enough to see on select nights and yet too far away for us any of us to ever touch. The prospect of sending humans towards it is a tantalizing one, however; so tantalizing, in fact, that one super-rich space tourist, Dennis Tito, and his non-profit space company, the Inspiration Mars Foundation (IMF), have decided to send two humans on a fly-by of Curiosity's new pad in 2018. So, what kind of people do you send on a 500-day round trip to Mars and back? The answer, according to Jane Poynter, president of the Paragon Space Development Corporation (a life support systems developer) and a member of the Inspiration Mars team, is a happily married heterosexual couple. "It's important that this is a man and a woman because they represent humanity," said Poynter. "After all, we are more or less 50 percent men and 50 percent women [on Earth]. It represents our children - whether they are a girl or a boy, they see themselves reflected in that crew." Added to that, the team says that a married couple are the most likely to be able to help one another through the psychological impact of being stuck in a box in space for such a long stretch of time. When it comes to spending time with a spouse in an enclosed space, Poynter has more experience than most: She and her husband were two of the participants in the fascinating Biosphere 2 experiment of 1991. "It was extremely helpful to have somebody that I could problem solve with," said Poynter, reflecting on Biosphere 2. "It was also fantastic to have the opportunity to be there and share the experience when we had those wondrous moments." She also added that when the time comes, she expects that she and her husband will apply to be the couple to fly to Mars. Interesting as that is, however, there is something of a leap between 2 years on Earth in a bubble and 500 days in the inky black in a tin the size of a parking space. That's no exaggeration, either; because of the required fuel, water, and mechanical weight, living space in the IMF's planned Mars vehicle would be that small. Additionally, there are no provisions in the plans for hygiene equipment more complex than sponges. At the moment, Tito and his team are still seeking funding for the early stages of the mission. They insist that the technology required to achieve their goal, which relies on the craft slingshotting around Mars in one go, exists, and that the biggest danger - radiation in space - will have been solved by technological advancements prior to their launch date. However, at time of writing, it would seem to be the case that the private donors required to provide the hundreds of millions of dollars (that's the conservative estimate; others go upwards of $1 billion) to fund this brave, exciting venture are reluctant to come forward. It's easy to see why the money has been slow, given the scope of the task and the proximity of 2018. Without that money, all of this planning will have been for naught. Still, imagine coming home to your wife or husband and being able to tell them, "Honey, we're going to Mars! Just you and me, in a tin with no shower, for 500 days! 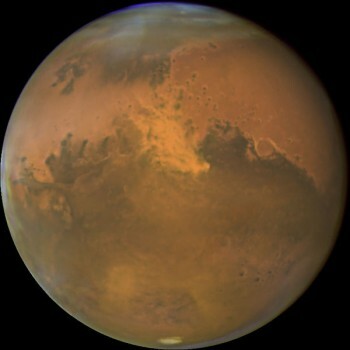 And we get to see Mars!" And then the look on their face as they contemplate travelling with you through in the cold, sweet, lifeless expanse of space for 500 days with no way of turning the craft around and heading home. Nothing more romantic, right?